One advantage to being retired is I get to prioritize projects at home. I leveraged this luxury into a pretty neat surprise for Alice last Friday. The end of Spring semester is often hard on Alice, and this year has been no exception. There just seems to be no relief except the weekends, which fly by too quickly. During the day on Friday, I got an email from Alice suggesting we might sit out on the patio after she got home if it was warm enough. “Hmmm,” I thought to myself. The dock was still on land from last fall, and one project for the next few weeks was to be to launch it. 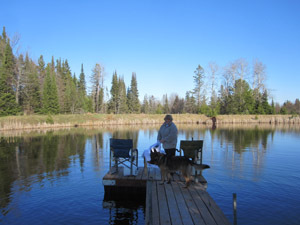 Alice and I have really enjoyed the dock for sitting and enjoying the wind and water after a hard day’s work. Why not launch the dock today and surprise her with a dock-sit when she came home from work? So I started the dozer and lumbered out there with it. I reeled out the winch cable and hooked a choker up to the outer leg of the dock, walked back to the dozer, engaged the winch, and watched the dock gracefully undulate down to the water, and float there like a graceful waterfowl. I’ve done this sort of thing enough times to know that many things could go wrong and convert this project from a quick one to an ordeal. This time it went pretty slick. I walked out on the floating dock and tied a rope to one of the outboard legs, walked back to the land, and gave a tug. The dock swung around and floated directly to her land cradle. With one hand on the rope and another on the end of the dock, I lifted it up and onto the cradle. “Thunk,” and that part was done. Next I got in the canoe with the pipe wrench, and removed the pins from the legs. One by one I dropped the legs through the sleeve and into the soft mud, and then used the pipe wrench to auger them into the pond bottom. In about a half hour I was done. No mishaps, dropped pins, missing wrenches, nothing. Since I had a bit of time to spare now, I drove the dozer back to the shop and grabbed my wheelbarrow. I have a small table I had built as scaffolding for a project some years ago, which I loaded into the wheelbarrow. I dug out a scrap of ripped flannel sheeting for a table cloth, and stapled this to the table. Then I got our dock chairs out of storage and set them up. I filled some cat litter plastic jugs with pond water and laid them across the legs of the chairs so they wouldn’t blow into the pond. Then I went back into the house and got a stainless steel bowl and some ice, and put a bottle of wine in it. This got carried out to the dock along with a wine glass and cork screw. Now the only problem would be to get her out there without suspecting that something was amiss. When she came home I suggested we do the sit on the patio she had suggested, but wait! The folding chairs we would need to sit out there were still stored out in the shed by the pond. Would she like to walk out there with me. She hemmed and hawed briefly, but in the end we walked out there. When we cleared the hill it began to dawn on her that she’d been fooled. It wasn’t until she’d walked out on the dock that she discovered the table and the bottle of wine. She was a happy girl. I was pretty happy too. The ruse had worked about as well as I could have hoped. Here is a picture of her discovering the wine in the bowl. 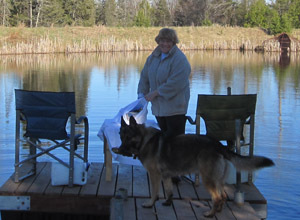 We had a lovely dock sit; memorable as all first ones of the season should be. This entry was posted on Saturday, April 7th, 2012 at 9:06 pm and is filed under Uncategorized. You can follow any responses to this entry through the RSS 2.0 feed. You can leave a response, or trackback from your own site.